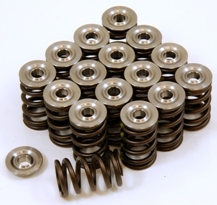 Valvetrain Kit: Titanium retainers, valve springs, and seat locators. GSC Power-Division S1 camshafts for the 2008+ STI EJ257B With Dual AVCS. Good for stock turbo or up to 500WHP(GT35R) upgrades. These cams require and upgraded valve spring kit to keep everything safe at high rpm.